Nose surgery is designed to reduce excess cartilage and bone in the nose, removing irregularities and bumps to give a straightened, smooth and, usually, smaller appearance. 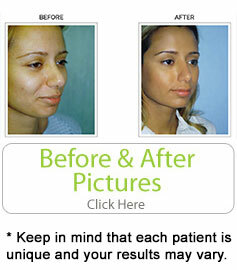 Adding tissue to enhance certain features of the nose can also be performed. The current trend in nose surgery is towards individualized treatment of each segment of the nose to give a balanced and refined look without compromising function as opposed to over-reduction of tissue which can reduce the ability to breath through the nose. As with all surgical procedures, you should discuss all potential risks and benefits with your surgeon. What is the goal of nose surgery? Today, nose surgery is one of the most popular options among plastic surgery candidates. The goal of the surgery itself is to transform the appearance of the nose, reshaping it so that it looks more like the patient’s ideal. This process involves changing the shape of the cartilage that makes up the nose, and sometimes involves tucking or removing skin to give the nose its ideal shape. Are there any side effects that can result from the operation? Yes, but these side effects are rare. The most common side effects include the risk of infection or excessive bleeding, as well as a potential adverse reaction to the local anesthesia used by a physician. In addition to these more medical side effects, patients do risk needing future procedures if they are unhappy with the result of the operation. Because the goal of these procedures is almost always aesthetic, it’s possible that patients will need to seek multiple operations to achieve their ideal result. How do patients prepare for this kind of surgery? Plastic surgeons generally recommend that their patients stop using prescription medications, or even over-the-counter options, a few days before surgery. This is because many medications can prevent clotting, leading to the excessive bleeding mentioned earlier. Furthermore, most surgeons absolutely insist that their patients stop smoking at least two months before the surgery. Smoking can greatly slow down the healing process and it might lead to its own set of complications and side effects if the behavior is not stopped in advance of the procedure. How long will it take to recovery from nose surgery? For the first seven to ten days after the surgery, patients will be required to wear a nose splint that will keep their nose’s new shape intact while promoting a shorter, healthier recovery. Swelling that results from the procedure will take a full two weeks to go away in most cases, and physicians do recommend that their patients refrain from any strenuous activity for at least a full month after the surgery is completed.